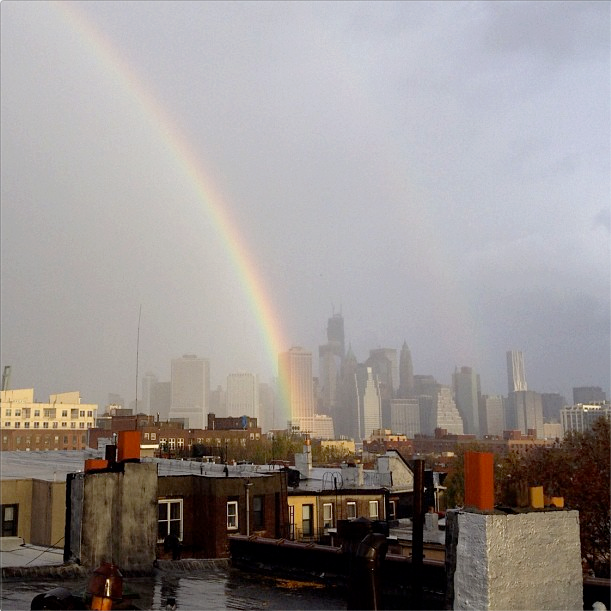 After Sandy, a rainbow over Manhattan. Via Presbyterian Disaster Assistance . As residents of New Jersey and New York work toward the full restoration of their households and livelihoods after Hurricane Sandy, among them churches of the Synod of the Northeast, we at PHS offer our assistance in preserving original church records damaged by water. Part of archivists' work is to prepare for disaster. True to form, shortly after the storm, archivists and conservators at the Museum of Modern Art in New York  held a workshop on disaster recovery for artistic and archival collections. Much of their advice for treating paper damaged by water is industry-standard, and can also be found in our guide to recovery for damp and wet paper . First, it’s important to appraise the kind of records damaged. Do not spend time or resources preserving materials without lasting value--travel itineraries, old bank statements, cancelled checks. Session minutes and registers are of chief importance. Consult our retention schedule  for more details. Next, find a space to stage collections for drying; the room should be below 65 degrees and 55% relative humidity. Set up an array of oscillating or box fans to circulate air over the damaged materials. Bound volumes which have been exposed to water can be laid open on a hard flat surface and fanned dry. Very wet, old or fragile volumes should have their pages interleaved with clean, uninked newsprint – this can be bought in pads as large as 24 x 36” at an art supply store. Individual sheets of paper can be laid flat on clean uninked newsprint to dry. Paper which has lain wet for 48 hours is susceptible to mold. If your congregation has records of permanent value which have been extensively damaged by water, debris or mold, please contact us. PHS can microfilm and digitize damaged records to ensure that their text will survive even if the paper fails. We can also refer extreme cases to outside paper conservators. As ever, we will gladly take on deposit records endangered by being stored in church attics and basements. Records here are held in a secure, climate-controlled environment and are tended by a dedicated staff of archivists. Please contact us for further information by email at [email protected]  or by phone at 215-627-1852. We wish you all a speedy and complete recovery.